On Saturday 15th April we're inviting everyone at Kerith along with friends and family to an Easter Fun Day at Sandhurst School from 1-3pm. Tickets cost £1 per child with adults free - you can get tickets and all the other details you need here. 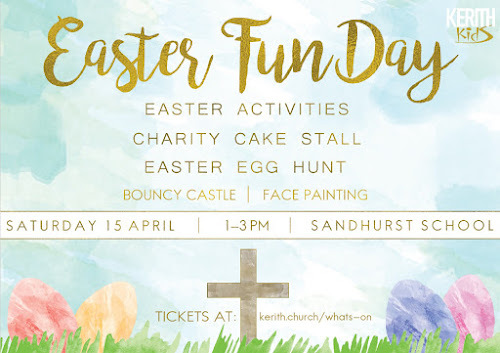 There's going to be an Easter egg hunt, a bouncy castle, face painting, and a charity cake sale for Tehila and Novo. Book early to guarantee taking part in the Easter Egg Hunt!